麺や天鳳しげる (Noodle Shop Heavenly Phoenix Shigeru) was the first bowl of noodles I tried upon arrival in Tokyo. A friend of mine who had previously spent time studying at Waseda had recommended it highly, and it was practically across the street, so I figured it was as good a place to start as any. Inside the store is almost all polished black surfaces, taking a page from the trend of "fancy ramen" stores, without overdoing it too much. Even the manga available to read while waiting had been carefully selected - the full run of "Fist of the North Star," nothing more nothing less. Naturally, the spines of the books are also black. Somewhat unusually for such a high concept "modern" style store, Shigeru offers a selection of the different main varities of ramen (shio (salt), shôyû (soy sauce), and miso (soybean paste), in addition to tantanmen ("Chinese-style" noodles), available in both Black and White Sesame types. There also seem to be rotating seasonal specials, but, tempting as the special spicy miso sounded, I couldn't help but order the Black Sesame tantanmen. Black Sesame (kurogoma) is one of those tastes that can do no wrong as far as I'm concerned, and its addition to any dish usually makes it a sure fire winner in my book. The same was true at Shigeru. 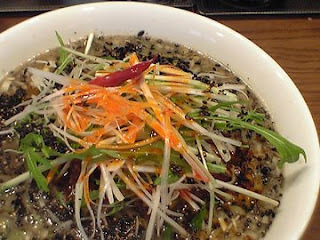 The taste of the sweet black sesame blended perfectly with the rich soup, and the thick black color of the broth was very nice, and of course, entirely appropriate for the varnished black interior of the restaurant. The soup was topped with a massive pile of onions splashed with a bit of spicy red chili oil. The noodles had little to nothing to do with Sichuanese style dandanmian, the ostensible progenitor of the tantanmen style, but, save for Chinese-style restaurants, this is almost always the case. Other than having sesame and chili oil, I'm not really sure what made these tantanmen, rather than ramen, but I didn't really care either. The onions were delicious, but made it difficult to taste the sesame after the first few bites. Noodles were fairly thick, chewy, and wavy, which is just how I like them. Overall, an excellent bowl of noodles, and one I returned to a second time before committing myself to making a full circuit of the region's noodle shop offerings.